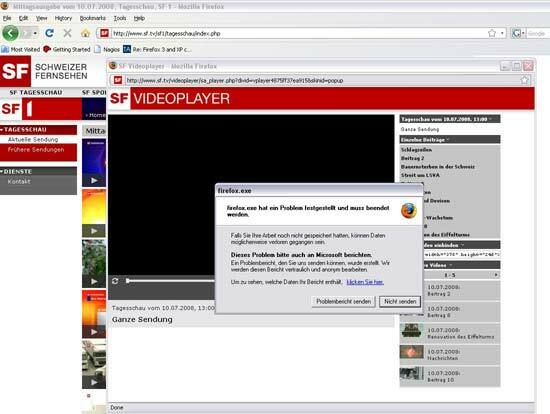 A really strange behaviour occured to me today, when trying to play certain Flash videos (namely on www.sf.tv): My Firefox 3 browser crashed as soon as the Flash videos started to load (see screenshot). What to do in this case? Troubleshooting! On a website (http://www.tech-archive.net/Archive/WinXP/microsoft.public.windowsxp.general/2008-07/msg00395.html) I found the hint, that the newest (BETA!!!) version of Flash Player would solve this problem. So I installed Flash Player 10 Beta 2 from http://labs.adobe.com/downloads/flashplayer10.html. In the release informations of this version I read "bug fixes" - so let's give it a try. After removing all previous Flash versions and the installation of the new Flash Player 10 Beta 2, all the Flash videos worked really fine! Thanks for this great advice, Arte Marte! So I assume the following facts lets Firefox crash: Windows XP SP3 -> Firefox 3 -> Flash 9.0.124 -> Internet connection through proxy.